Cat Protection’s foster care program is an essential part of our feline welfare program. It enables us to maximise the number of cats we can help each year (especially during kitten season which runs from about late September to late April) as well as ensuring cats and kittens are well-socialised and ‘forever family home-ready’. Raising kittens in a cattery environment is not ideal and they are at greater risk of flu because they are too young to be vaccinated. Foster carers volunteer to care for cats (typically mums & kittens, but sometimes shy adult cats who need a bit of one-on-one TLC) in their own homes until the cats are ready for adoption, at which point they are returned to Cat Protection. Foster carers do an incredible job helping kittens and cats become confident and playful, or in some cases rehabilitating cats who’ve lost their trust in people altogether. It’s a great way to spend time with cats for people who aren’t able to make the 15-20 year commitment that adoption requires. It can be sad to give up the little ones you’ve cared for – however, most people find great satisfaction knowing that they’ve helped a cat or kitten in their time of need, giving them the gift of being able to find a forever home they can call their very own. 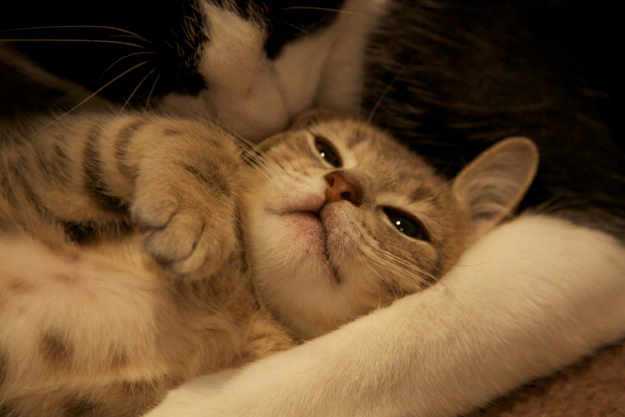 Cat Protection provides food, bedding, litter, information and support. Carers provide the love and attention. Unlike many other animal foster programs, Cat Protection foster carers are not responsible for finding homes for their charges and are not responsible for costs. You don’t have to foster all the time – you let us know what suits you. Most staff at Cat Protection have fostered so we know from both sides what it involves, if you have any questions please call our office on 02 9519 7201 or 02 9557 4818. If you are interested in becoming a foster carer, please complete the foster care program application form. You can find more information about how volunteers help us on our volunteering page.